Hollywood! A place full of hopes and dreams! 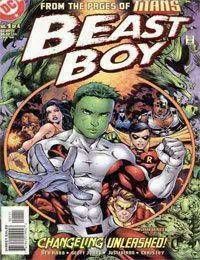 That is to say the hopes and dreams of one Garfield Logan better known as Beast Boy! With the Titans reforming and Beast Boy not invited, Gar decides to resurrect his acting carrier. When arriving in Tinsel Town Gar goes to his cousin Matts place to crash. Later that night the two hit the town and sneak into a night club where Gar is approached by a fan girl who recognizes him from the T.V. show he did as a kid. After rejecting her a larger man forces her into the ally with him. Seeing this Gar follows them into the ally to save the girl only to find the man dead, the girl gone, and the cops there to blame him!